Arconti still did not reply. Instead, he slid silently out of his chair and fell face first into the scattered files and folders on the floor. Blume leapt up, rushed around, and flicked the magistrate over as if saving him from drowning in a pool of papers. The magistrate's face was grey, his body stiff and unresponsive. Dead, just like that. Another dead Matteo Arconti. Two in one morning. A sudden urge to laugh welled up in him, but when it broke his lips, it was as an angry shout. Milan: the magistrate and his police team watch the CCTV footage of a fourteen-year-old girl, a journalist's daughter, getting into a car – seemingly of her own will. The car drives off. The girl has now been missing since yesterday. The magistrate warns his team that it will not end well. Elsewhere in Milan an accountant is on his way to his office at an insurance company. As he throws his briefcase onto the back seat of his car he hears the sound of a van reversing at high speed towards him. The doors open. He is brutally overpowered and forced into the van, a bag thrust over his head, his wrists bound with plastic tape. His journey will last about an hour and a half and it will end with his death. Rome: the next day. On the street named after two magistrates murdered by the Cosa Nostra in 1992, the accountant's body is dumped near the courthouse. Commissioner Alec Blume of the Rome police visits the site. He has been discussing the case of a doctor's supposed suicide with its investigating magistrate, Matteo Arconti. It is a case that appears to be linked to the powerful but secretive Calabrian mafia, the Ndrangheta. Now Blume is standing over the body of another Matteo Arconti, a Milanese accountant. Blume wonders if the Ndrangheta is sending a message and finding out precisely who sent it will take Blume on a bizarre and dangerous journey into the heart of Calabria. THE NAMESAKE is Conor Fitzgerald's third book to feature Police Commissioner Alec Blume; the previous two being the THE DOGS OF ROME and THE FATAL TOUCH. 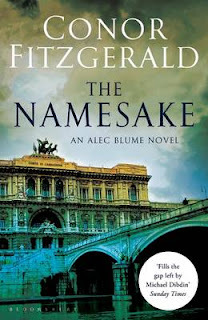 Irish writer Fitzgerald has lived in Italy for over twenty years and I wonder if this is what has led him to choose a foreign-born resident as his lead character of the American-born Rome detective, Blume. The plot of THE NAMESAKE focusses on the Calabrian mafia or Ndrangheta. In an interview with writer Declan Burke, the author describes the Ndrangheta as: "… the most powerful mafia in Europe, not just Italy … They completely control the European cocaine trade … they have a GDP the size of Slovenia." This secretive society has been the subject of other crime novels such as Michele Giuttari's A DEATH IN CALABRIA. But the Giuttari novel is more of a straightforward police procedural. Being procedural does not appear to be Blume's forte and in THE NAMESAKE Fitzgerald provides a more intimate view of Calabrian life and its relationship to the Ndrangheta with its tight-lipped, allusive culture, strict hierarchies and codes of honour. These convolutions, of themselves, add to the mystery and suspense of Fitzgerald's book. I admit to a bad start with THE NAMESAKE. It has a standard “crime novel” beginning in which the initial chapters are set in separate locations, describe separate incidents and involve different characters; but add to this a parade of administrative acronyms (although there is a helpful appendix at the end of the book ready to put it all in place); the fact that I had not read any of the Blume series before – and I lost my grip. My difficulty getting into the book may simply have lain in the contrast between Fitzgerald's style and that of the book that I had just finished reading. In all I decided that I had wrong-footed myself and gave it another go. My reward was a richer and warmer experience and one that would certainly encourage me to read more of the series. Fitzgerald's writing is shot through with a subtle humour which brought about a growing feeling of warmth towards the wilfully awkward and human Blume – whom I had initially dismissed as cold and misanthropic. The story's pace accelerates to an absorbing conclusion in a plot that ricochets between Milan, Rome and Calabria; whilst the vitality of Fitzgerald's characters accompanies a darker tone of dispassionate fatal events. Ultimately this book is a rewarding, thoughtful read. When asked in an interview what three words best describe his writing, Fitzgerald answered “Place, character, mortality.” I cannot sum up the core qualities of THE NAMESAKE any better. Thanks. I enjoy being part of your Mostl Crime blog list!